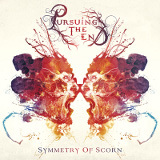 Pursuing the End's Symmetry of Scorn is hard to quantify. There's a lot not to like on it, but there are some rather good parts on it as well. Either way, this isn't likely to be the sort of album that a metal purist is going to find attractive; this is an album that tries to be as metal as possible within its genre, but hedges its bets with pop elements. Though the album is billed as "melodic metalcore", I'd better describe it as melodeath with goth metal elements -- the "metalcore" part comes from the techno effects used that occasionally try help the song along, but mostly fall flat. Despite the positioning of female vocalist Chiara Manese as the primary singer (at least in the band pictures), Giacomo Benamati does most of the singing -- well, death-metal growling. Manese comes in pretty much only on the choruses, and her voice doesn't stand out much, but it's passable, and in some ways it's nice that she is not so front-and-center in the spotlight that one hears her all the time. There is a wistful quality to her choruses that saves the rather simplistic melodies from becoming too cloying. The guitar solos are surprisingly good for a goth metal album, especially in Cage of Hypocrisy and From the Ashes, though I wasn't a huge fan of the keyboard parts, which sounded much too techno-oriented for me. Mercyful Vengeance (yes, spelled the same way as the King Diamond-fronted band), and Out of Control has more of Manese's singing, which actually left me wishing they'd added her to more of the tracks. All that growling, and the blast beats and rhythm guitar riffs that go with them, are pretty generic and get old fast, but her heavily-accented vocals, while not amazing, have a certain sweetness to them that makes for a nice change of pace. The melody on the title track suffers from some of the flaws seen in earlier tracks -- too many musicians trying too much at the same time. Between the vocalists, the keyboardist's FX, and the guitarists, the track is quickly filled with what amounts to almost pure noise. The final track, Changes, is substantially better, as the band seems tighter and the melody has more focus, and as a result, the album ends on a high note. Goth metal is easy to do wrong, and Pursuing the End is mostly playing it safe and not putting themselves too far out on a limb with their audience. This album isn't the worst goth metal I've ever heard; though its weaknesses are real and occasionally painful, Symmetry of Scorn manages to keep itself above average.